However, Fujifilm users with Nissin flashes could not do radio-triggered HSS. This has now been resolved with the latest firmware update that Nissin has been rolling out: Fujifilm users (X-T2, X-Pro2, GFX…) have now access to radio-controlled off-camera TTL HSS flash with Nissin. The bad news if you already own an Air 1 commander and Nissin speedlights is that you cannot update these firmwares yourself, so you need to send your units back to Nissin for them to perform the update. However, if you are buying them now, chances are that the units on sale have already been updated. I bought my Air 1 commander and a i60A speedlight this week-end, and both were already rocking the updated Firmware for Fujifilm users, but make sure to check with your retailer beforehand. Until I got the Nissin flash system, I was using a Yongnuo YN560-III with a couple of RF603C-II transceivers (no TTL, no HSS). Obviously there are more advanced Yongnuo products including radio triggers + flashes, but since I was not impressed by the durability of my previous Yongnuo experience, I wanted to explore new options. What about the Fuji EF-X500? Being invested in the Fujifilm X-Mount system, it would be logical to consider the EF-X500, which finally made it to the market after a bumpy development road between Metz (who is doing this flash despite of it being ultimately branded Fujifilm) filing for insolvency and overheating issues of the early design. However the EF-X500 does not make it for me. In the absence of a remote trigger being developed and released at the same time, you need to buy 2 EF-X500’s in order to trigger one remotely (the other bulky unit being mounted on top of your camera), so the entry cost is already 2 times the cost of one speedlight. Moreover, the trigger is optical and not radio, so you need “line of sight” between the commander flash on top of your camera and the receiver flash. You might think it’s not a big deal, but a lot of time when you light up a scene, you will be looking for ways to do so while hiding the flash behind some elements of the scene or walls, hence breaking the “line of sight”. The one small advantage that the EF-X500 gets is that the flash has a light that can be used to assist the AF in the dark. Other brands also have this AF-assist light on their flash units, but Fujifilm is currently preventing them from being used. While I also considered options such as Cactus or Godox, I decided to go with Nissin, because it is a Japanese company (while the other 2 are from Hong Kong and Shenzhen), hoping for better quality control, but more importantly for good local support if needed after my Yongnuo experience. In fact, the shop where I bought my Air 1 and i60A has very close ties to Nissin, as Nissin has shot test images in this shop’s studio, and their stock was already upgraded to the newest firmware for Fujifilm users. In any case, please note that I never used any Cactus or Godox products, so I can’t speak to their quality and they could very well be awesome products. I am just sharing my personal decision process. If you decide to go Nissin and buy an Air 1 commander, the first question to ask yourself is should you get the Di700 or i60A flash (the i40A does not have a radio receiver to pair it with the Air 1 commander)? While slightly less powerful than the i60A (GN54 vs GN60), the Di700 is more than powerful enough for my and most people’s need, costs less than the i60A (especially if you get it in bundle with the Air 1), but has the same radio transmission system… and also a super cute and stylish screen with bright color icons. I think it is great value. However, it is markedly bigger than the i60A, and for me having a flash small enough that I will be carrying it in my bag – rather than leaving it gathering dust in a closet -, was a very important factor, which is why I personally went with the i60A. Also, the Di700 has a weird compartment supposed to make loading the 4 AA batteries easier, but it just looks more cumbersome to me. That’s all there is to it, the pairing is done. The beeping of the flash unit and the flashing of the commander unit will then stop. 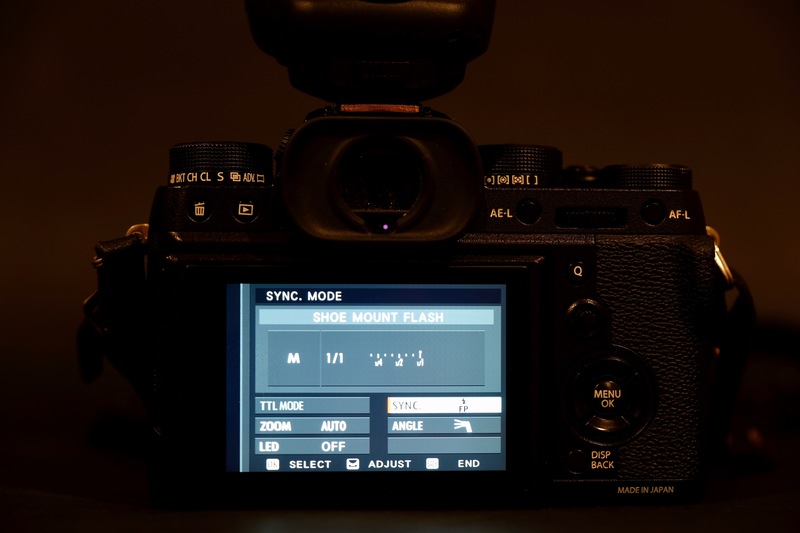 In standard mode (not HSS), the flash fires one flash of light, so you can choose between front curtain sync (the flash fires immediately after the shutter opens) or rear curtain sync (the flash waits before firing just before the second curtain is about to start closing). If the shutter speed is to fast (faster than 1/250th of a second in the case of the X-T2), the second curtain has already started to close when that flash of lights happens, creating a black band at the bottom or top of the picture (depending on your sync mode). In HSS mode however, the speedlight does not fire just one single flash of light, but simulates some sort of almost continuous lighting to avoid the black band by firing several very fast bursts of lights close to each other. While HSS will enable you to use a fast shutter speed with your flash, it will also take a much bigger toll on your flash as you are asking your speedlight to fire several bursts in super quick succession, while pushing the power up for the same exposure as with a standard speed sync. With great power comes great responsibility, I guess (or something like that). That’s all for there is to it, so if you are using a fast shutter speed with your flash and getting a black band, make sure you have selected the setting above. You want to use a wide aperture for shallow depth-of-field during sunset? First, meter for a good exposure of the sky. In this example, the X-T2 gave me 1/8000th of a sec at ISO 200 and f1.4. This will likely leave the subject completely underexposed, as in the example above, hence the need to bring in a flash. The shutter speed being faster than 1/250th of a sec, HSS comes to the rescue. All these images are JPEGs straight out of the camera. Setting up the flash exposure was very easy. I paired the commander and the flash unit, put the flash where I wanted the light to come from, and then I just used the wheel on the commander to dial the flash power up or down. Since this was in HSS mode, I had to use the flash at almost full power. Can you tell me where you bought the flash? I’m currently in the market but none of the retailers can confirm if the new flash has the HSS firmware already installed. Thanks! I bought it from a shop called “Fujiya camera” in the Nakano area of Tokyo. Do you know for occasion, does the i40 flash (after FW upgrade) can be used like the i60A (TTL and HSS over radio module) you talked about? The i40 does not have a radio transmission module, so it cannot be used with the Air 1 commander. Just wondering how one can tell if the i60a and Air Commander have the latest Firmware? I’m considering buying this used from someone who’s liquidating their Fuji gear. Thanks!